LTC (Ret.) Charles H. Duckworth of Peachtree City, GA passed away on Sunday, April 7, 2019, after a long, brave battle with cancer. He died peacefully in his home with his beloved wife, Susan by his side. Charles was born on August 24, 1937 in Parkersburg, WV, a place he often referred to as “God’s Country.” As a boy, he and his brother, Robert, loved life on the farm and exploring new and inventive ways of getting into mischief together. 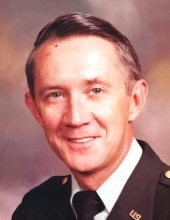 After graduating from Parkersburg High School, Charles went on to study at Marshall University and upon graduation was commissioned in the United States Army. In the fall of 1979, during a tour of duty in Korea, he met the love of his life Susan. They married on July 12, 1980 and were happily married for nearly 39 years. Charles was a veteran of over 26 years active duty service in the United States Army, where he rose to the rank of Lieutenant Colonel. He was a graduate of the Army War College and a combat veteran, completing two tours of duty in the Vietnam War. His many decorations include the Distinguished Flying Cross, Bronze Star Medal – 3, Meritorious Service Medal – 4, Air Medal, Air Medal with Valor, Vietnam Service Medal – 6, Combat Infantry Badge, Master Parachutist Badge, and Ranger Tab. After retiring, Charles became a talented craftsman and could often be found in his garage and workshop, fixing some random appliance or building something entirely new from scratch. He also enjoyed visiting his family all across the United States and in Korea. He also was an avid Washington Redskins fan throughout many disappointing seasons. Charles is preceded in death by his parents, Charles and Berdetta Duckworth, as well as his brother, Robert Duckworth. Left to cherish his life and legacy are his wife, Susan Duckworth; daughters, Tina Duckworth and Cynthia Duckworth; grandchildren, Kelcy (William) Rourke, Ashley (Robert) Smith, and Tyler Kramer; great-grandchildren, Hadley and Holden Smith; sister-in-law, Karen Duckworth; niece, Sara Duckworth, and nephews, Gregory Duckworth, Jimmy Duckworth, and Junho Hong. Charles was a strong, proud man, even in his final hours. He was loved and will be missed by many. A memorial service will be held on Saturday, April 13, 2019 at 3:00 PM at the Chapel of Mowell Funeral Home, Peachtree City. The family will receive visitors at 2:00, prior to the service. To send flowers or a remembrance gift to the family of Charles Hubert Duckworth, please visit our Tribute Store. "Email Address" would like to share the life celebration of Charles Hubert Duckworth. Click on the "link" to go to share a favorite memory or leave a condolence message for the family.